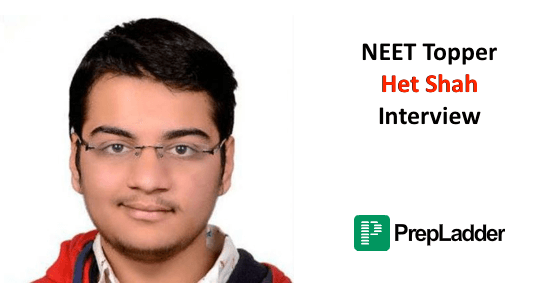 Het Shah has emerged as the topper of NEET 2016 and has secured AIR 4 in AIIMS. In an interaction with the media, Shah reported that he was highly motivated by the previous year toppers of NEET. He further added that Toppers had been his source of inspiration and he frequently watched their videos and took tips from them. Shah is currently a first year MBBS Student at AIIMS, New Delhi. He stated that he was anticipating a rank in the Top 10 but was not expecting AIR 1 in the exam. He further added that he was delighted and overwhelmed by the results. Shah hails from Nadiad, a small town in Gujarat and had always been a bright student in academics. He secured 94.2% in CBSE Class 12th examination. His father is a businessman and mother is a housewife. In 2014, like thousands of other medical aspirants, relocated to Kota,for dedicated preparation of medical entrance exams. He enrolled in classroom coaching program in Allen Career Institute, Kota. In 2015, Shah secured AIR 6 in Kishore Vaigyanik Protsahan Yojana (KYPY) which was a scholarship program initiative of the Department of Science and Technology. He proceeded to qualify the first stage of Biology and Physics Olympiad. Besides academics, he is fond of reading fiction novels and is a fan of contemporary music. His father, Sanjay Shah said that he was very delighted with his son’s results. Will NEET be held again? When questioned about his NEET preparation strategy, Shah stated that Hard Work is indispensable for success and one needs to remain focused throughout the preparation. Nonetheless, in comparison to other aspirants who would study for 12 hours a day, Shah devoted 6 hours a day to study. Shah further added that it is highly imperative to clear the basic concepts. He added that a majority of candidates expect intricate questions in entrance exams. He went on to say that most of the questions are based on the core concepts and aspirants must thoroughly prepare NCERT books before moving to anything else. On being questioned about his future goals, he stated that he is not much certain about the future goals at this point. Nonetheless, he added that his goal is to pursue Neurosurgery in the future. Stay Tuned for the latest updates on NEET 2016!